CRANKY croc Charlie wants much smaller sibling Peter Pan off his back. Brotherly rivalry is alive in the reptile world and a pesky loved one can quickly become just another snack. 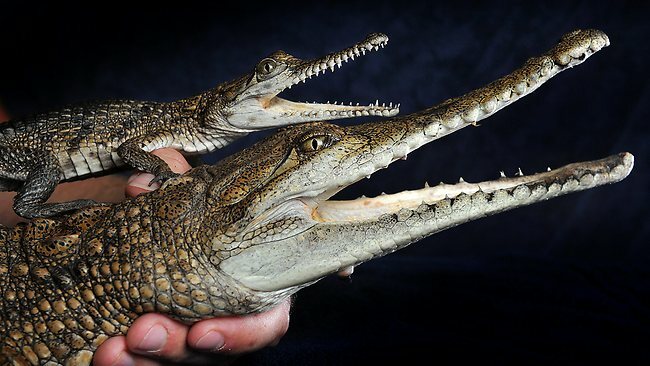 The freshwater crocodiles were born from the same clutch of eggs five years ago. But an extremely rare genetic condition has kept Peter Pan a miniature version of his more fearsome family members, with Charlie at least five times bigger, heavier and hungrier. Owner Scott D'Agostino says his little pet doesn't know he's a tiny version of the larger deadlier predators and has a feisty bite to prove it. He even has his own Facebook site. "He eats the same food, is healthy and happy but just hasn't grown up at all," he said. "He was named after Peter Pan from the story of the boy who never grew up." The scaly pair will join the police dog squad and amazing animal survivors at a huge open day at Melbourne University's Veterinary Hospital at Werribee tomorrow. The specialist animal hospital treats about 17,000 pets a year. Vets will join pets to teach people how to read animal body language and provide career advice to students keen to work with our four-legged or feathered friends. The day will feature demonstrations on health and nutrition, dog obedience, horse health and fascinating reptiles. Melbourne Cup winners Doriemus and Brew are guests of honour. The open day will be held from 10am-3pm at the hospital, 250 Princes Freeway, Werribee.